OK, OK, here's what I really look like when I go to Jazzercise class. HA! But, apparently I am on the cutting edge of cool over here. Jazzercise and other aerobic workouts like it are making a resurgence and they're doing it in the mecca of all things cool, New York City. 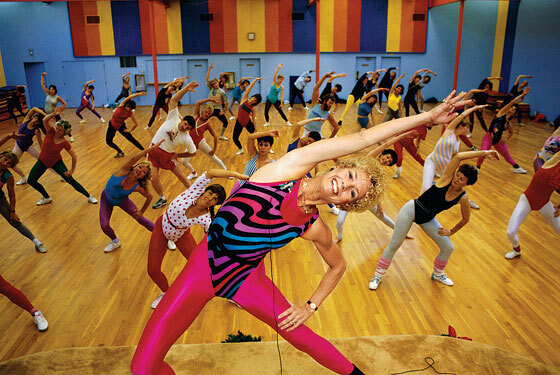 New York magazine recently ran a feature about Eighties-inspired fitness classes happening all over NYC. Author Sarah Bernard spells it out, "Just as bat-winged sweaters and pegged pants are reappearing on runways, classic cardio burns from the eighties are back in fashion, too. The primary appeal: They’re simple and they make you sweat." And, I swear it's tons of fun to wear a purple thonged leotard.